ABS-CBN features over 400 Kapamilya stars in its 2018 Christmas station ID with the theme "Family is Love." Meanwhile, GMA-7's 2018 Christmas station ID "Ipadama ang Puso ng Pasko" features over 800 Kapuso artists and employees. Two rival networks aired its 2018 Christmas Station IDs on the same day this 2018. ABS-CBN aired its 2018 Christmas Station ID during its newly reformatted ASAP Natin'To! Meanwhile, GMA-7 aired its 2018 Christmas Station ID during its noontime comedy variety show Sunday PinaSaya. Over 400 Kapamilya stars from ABS-CBN’s entertainment and news programs on its various media platforms were part of the video. 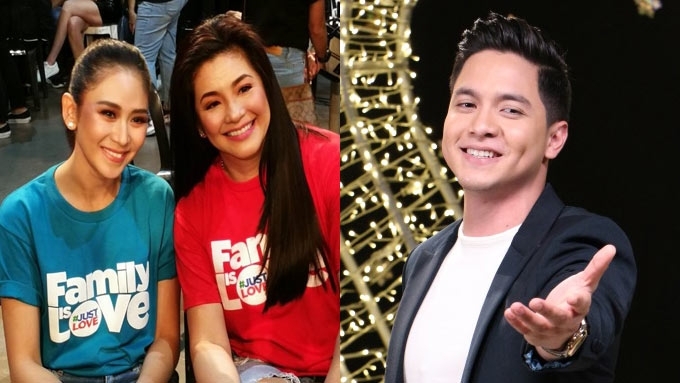 Former Kapuso Regine Velasquez joined other ABS-CBN stars in this year's Xmas station ID. The lyrics of this year's theme song were written by ABS-CBN Creative Communications Management division head Robert Labayen and Lloyd Oliver “Tiny” Corpuz, and with music by Marcus Davis and Amber Davis. "Ipadama ang Puso ng Pasko"
GMA-7's Christmas Station ID 2018 "Ipadama ang Puso ng Pasko" features over 800 Kapuso artists and employees. GMA Network ushers in the holiday season with a powerful message of love through its 2018 Christmas station ID dubbed “Ipadama ang Puso ng Pasko.” It premiered today, November 18, on Sunday PinaSaya. The Kapuso Network brought together communities here and abroad to celebrate the heart of Christmas. The Christmas campaign also put the spotlight on the Kapuso Network by showing how its talents and personalities reached out to help communities in their own ways. According to the Kapuso Network, the Xmas station ID "symbolizes the essence of being a Kapuso." Some of the scenes featured were the bayanihan preparation of Give-A-Gift: Alay Sa Batang Pinoy Noche Buena packs at the GMA Kapuso Foundation (GMAKF) Operations Center led by its founder and ambassador Mel Tiangco; various personalities participating in different outreach activities that spread love and bring cheer to communities; and the inspiring story of how GMA’s four-decade long medical-social service TV program Kapwa Ko, Mahal Ko continues to touch lives. The theme song titled “Puso ng Pasko” was performed by various Kapuso personalities headlined by Michael V, Alden Richards, Jennylyn Mercado, Tom Rodriguez, Lovi Poe, Christian Bautista, Aicelle Santos, The Clash Grand Champion Golden Cañedo, and Julie Ann San Jose. The song has lyrics by Rexy Jolly Conopio and BJ Camaya while music was composed and arranged by Ann Figueroa. "Ipadama Ang Puso Ng Pasko," GMA-7 2018 Christmas Station ID features over 800 artists and employees. PEPsters, what can you say about the 2018 Christmas station IDs of ABS-CBN and GMA-7?